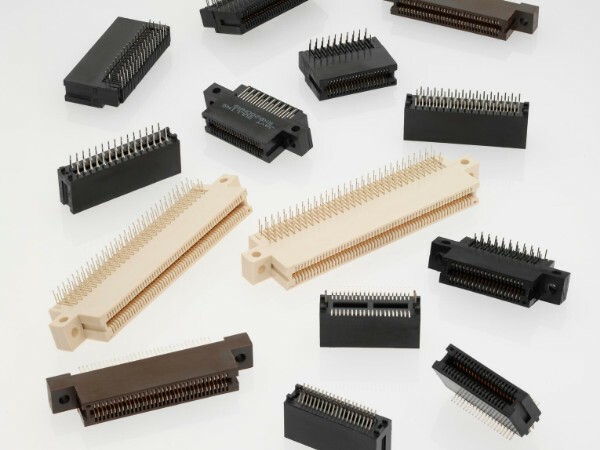 High Density Female Edgecard connectors are ideally suited for an array of dense packaging, board-to-board applications. The most popular contact pitches are 0.039″ (1.00mm) and 0.050″ (1.27mm) and include PCi Express configurations. These connectors are very much intended for use in high-density applications where board spacing and total weight are factors and are ideal in a wide array of consumer, industrial, and commercial applications. They are most frequently used in electronic component testing, communication equipment, medical equipment instrumentation, power converters and power supplies, along with aerospace and automotive systems and products. The most popular contact pitches are 0.039″ (1.00mm) and 0.050″ (1.27mm). These single-level card edge connectors are ideal for employment in a wide range of high-temperature, high-density medical, industrial process control and telecommunications designs in which the board is thinner or thicker than standard boards, as well as those in which a standard 1.6mm board is indicated. The parts accommodating 1mm thick boards are particularly well suited for medical applications, while those engineered for 2.4mm boards are commonly used in multi-layered, thicker board designs. The high-density 1.27mm contact centre card-edge connectors range has been expanded to include the FMBx Series. The new series features high-temperature and low-profile ultra-thin devices accommodating boards in thicknesses of 0.8mm, 1.6mm and 2.4mm. The series supports an operating temperature range of from -65C to +200C, while the low-profile ultra-thin interconnects notably offer a profile of only 12.39mm. Also available are 1mm versions, which support operating temperature ranges of from -65C to +200C. High Density Edgecard connectors are ideally suited for an array of dense packaging, board-to-board applications requiring the connection of a mother board to a 1.58 mm (0.062” +/- 0.008”) daughtercard – for example, PCIe card edge connectors are frequently specified for use in desktop computers, servers, workstations, storage systems, Redundant Array of Independent Disks (RAID) controllers, fiber channel host-bus adapters, routers and switches. Used in Aircraft Electronic controls and radio communications, Automotive electronics, gaming devices, medical devices and so much more. One High Density example, PCI Express® (PCIe) card edge connectors specifically enable easy and cost effective implementation of PCIe architecture in desktop computers, communications equipment, workstations, and factory automation equipment. Highly reliable and durable, these connectors fully support the PCIe standards for signal and power as well as auxiliary signals at the interface between the motherboard and add-in card. The 1.00 mm pitch, one-piece parts feature slots accepting 1.58 mm (0.062”) thick add-on graphics cards for user upgrades and support x1, x4, x8, x16, x24, and x32 contact positions to accommodate an extensive range of bandwidth requirements. The series is moreover engineered to optimize both design flexibility and manufacturing efficiencies as devices are provided in a wide range of termination types and mounting styles. Parts’ serial lanes are comprised of two differential wire pairs that support a data transfer rate of 500 MB/s in each direction, per lane. They additionally feature a 2.5 GHz clock rate, and a 5 GT/s (gigatransfers per second) bit rate.